Smoking meat generally means putting in a long shift around the grill. The positive side of this is you can enjoy several nice cold beers and listen to some tunes, so it’s seen as all just part and parcel of the low and slow cooking experience. However, there are times when you’d rather not be chained to the grill and have the freedom to join in other activities or festivities your neighborhood has to offer. This is when a BBQ temperature controller comes in handy. The scope and functionality of products that are marketed as BBQ/Grill/Smoking temperature controllers or regulators is quite vast. So it’s best to know what you’re looking for before making a purchase. In this article I’ll tell you which controllers I believe are the best, as well as giving you details of things to look for when buying. What’s the best BBQ temperature controller and what best suits your needs could well be two completely different products. And to be honest, it’s a little unfair to even compare some of these gadgets. You have the basic tool that is just a vent attachment that you manually open a certain amount to aid in regulating air flow. Then you have the all singing all dancing WiFi controlled unit with multiple probes, a great app and built-in algorithms to detect if the lid is open or if your meat is almost finished. There is no point comparing which of these is the best, but the simpler device might be all you need and therefore the better option. So I’ll tell you which device is probably technically the best, then give you a rundown on what options the other devices have in case that’s the temperature controller that fits your needs better. As with most gadgets, there are normally two or three main competitors vying for the number one spot. This is good for purchasers like me and you, as it means the companies are constantly trying to innovate and at the same time keep prices reasonable. This is also the case for BBQ temperature controllers. So I’ll be sure to keep this page up to date if anything changes, but for now, the Flame Boss 300 is going to get my recommendation as the best overall controller (remember what I’ve said above though, this doesn’t mean it’s the best one for you). 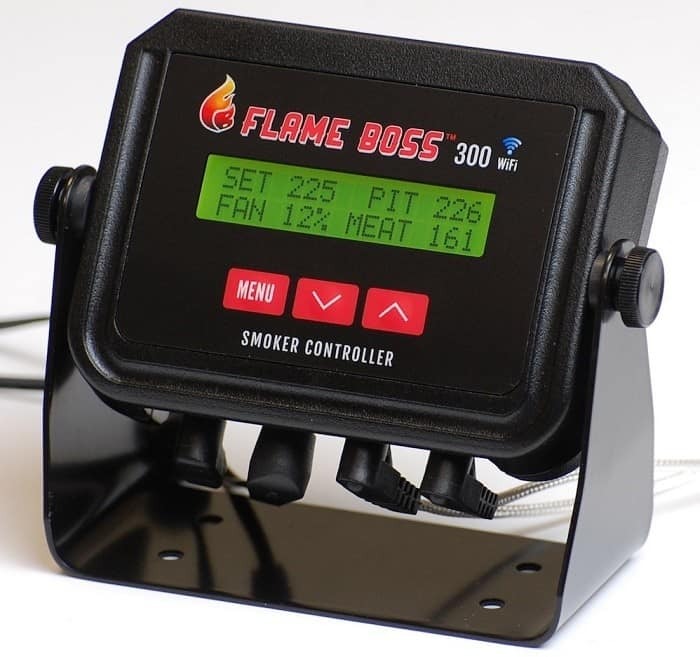 The Flame Boss 300 is WiFi enabled, has the option of three food probes, and a variable speed fan. This hardware is backed up with software that can detect if the lid has been opened, will keep food warm once the desired temperature is reached, and even send your phone a text telling you your food is almost ready so you better get home. Unlike many gadgets these days, there is no need to install an App on your phone/tablet or software to your computer. The Flame Boss 300 has a dashboard for monitoring and adjusting cooks that is browser based. Which means as long as you have Chrome, Explorer, Firefox or any of the other popular internet browsers available, then you will be able to interact with the Flame Boss. This isn’t the first BBQ temperature controller Flame Boss has made, the 300 is their latest model. So if the price is too high for you, or it just has more than you need then you might want to look at the Flame Boss 200 or 100 (the price difference between the 200 and 100 is so minimal I’d definitely say you should only be considering the 200 if you’re going for an early model). Unlike the Flame Boss that has three different models that are iterations of the previous model, BBQ Guru has three stand-alone models that are all current in their own right – but target how people use BBQ temperature controllers differently. They have a basic, intermediary and advanced model. I’m going to recommend the PartyQ model – which is their basic model. Does this mean I think the PartyQ is the second best BBQ temperature controller after the Flame Boss 300? No. It’s not even the second best BBQ Guru temperature controller (it’s their 3rd best). But its quality for its price makes it a bargain and even the more advanced models run off the same technology, just with more added features. Another great company whose main focus is BBQ temperature controllers is Pitmaster IQ. And just like BBQ Guru they have three different controllers, each targeting different needs and price levels. The model I like best is their mid-level kit called the IQ120. I had to think long and hard before adding the Tip Top Temp (TTT) to this article. Not because of any quality issues or functioning problems, because this gadget does exactly what it says it does, but because people expect some sort of electrical device with a fan when they look to buy a BBQ temperature controller. 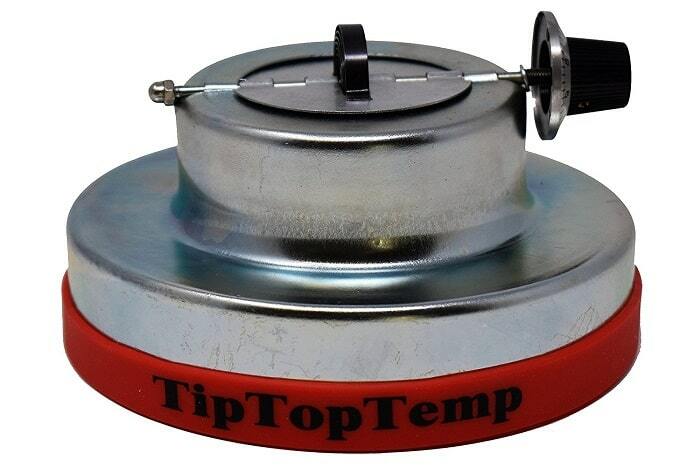 The Tip Top Temp isn’t such a device and in fact is more accurately described as an advanced vent unit. However, it does help with controlling temperatures. Combine this with a price that won’t break the bank and with it being useful for most types of cooks other than low and slow smoking, leads me to conclude that it’s a worthwhile investment as an entry level temperature regulator. The only one slight negative I have to say about the Tip Top Temp is the red silicone ring that’s used as a suction cup to keep the device in place will not hold if you tip the lid too much. I’ve seen people use strong magnets as a hack to keep the TTT in place, but as I’ve never tried this I can’t guarantee this works. Compatibility – Normally I’d put the price on the top of any list when it comes to buying something new. But with BBQ temperature controllers I think it best to highlight the danger of buying a gadget that isn’t compatible with your grill or smoker. Buying the wrong controller means you merely have an expensive paperweight – so be sure to double check. Price – A good BBQ controller is pretty expensive, so make sure you know exactly what you are going to be using it for before you buy it. Having all the latest features is all well and good, but if they are never used then you will be paying through the nose just to brag to your mates about how great the controller is. WiFi – This is a feature of the top of the range temperature controllers. This allows you to view and change the temps of your pit remotely. It is a very impressive feature but one I’d probably say will get limited use. Considering this feature will be responsible for the bulk of the price tag I’ll leave it to you to decide if you can justify it. For most long cooks all you need is a steady temperature, you’ll not need to play with it once set. Probes – A pit probe is standard with BBQ temperature controllers that can automatically (not manually) adjust temps. But maybe you’ll also want to buy one with meat probes. Odds are, if you’re a seasoned pitmaster, you already have a meat temp thermometer and think you’ll not need this feature. This thinking is wrong because having a meat probe that works in conjunction with the temp controller allows extra features like ramping down the pit temp as the cook comes closer to finishing. Detect an open lid – You don’t want all your alarms set off and your fan ratcheting up to its top gear just because you’ve opened the lid for a sneaky look at the food. And it’s something you’ll not have to worry about if your BBQ controller has an open lid detector. Alarms – Hopefully you’ll not need these but it’s better to be safe than sorry. 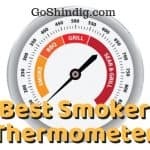 Yes, you’re buying a BBQ temperature controller to take the effort and worry out of smoking, but sometime things can still go wrong and the controller can do nothing about it other than to alert you to the problem. One such problem would be if you didn’t add enough charcoal or briquettes, no matter how hard the controller’s fan blows you’ll not get the heat you require. So the temp will drop, and once below a certain point, you’ll get an alarm go off. Temp Ramp mode – This is a great feature of some temperature controllers that have food probes built-in. The software algorithm will know the temp of the meat, the grill and your desired finishing temperature. It’ll do some calculations and know when to slowly lower the grill temperature so that you don’t overcook the meat. Power supply – The manual units will obviously have no power supply. The more advanced BBQ temperature controllers will either be batteries or mains power. If this is a gadget you want to take away camping or tailgating, the odds are you’ll want one that runs on batteries. If it’s for your backyard grill set-up mains power might be okay.